Loving the Sonder Camino ti but the stock Saddle and seatpost for me is the weak point so far. Love Brooks but dont really want leather on the ti gravel bike so today I ordered a Cambium C15 saddle in mud happy black. On the third morning we came across two kudus, dead, and partially eaten. 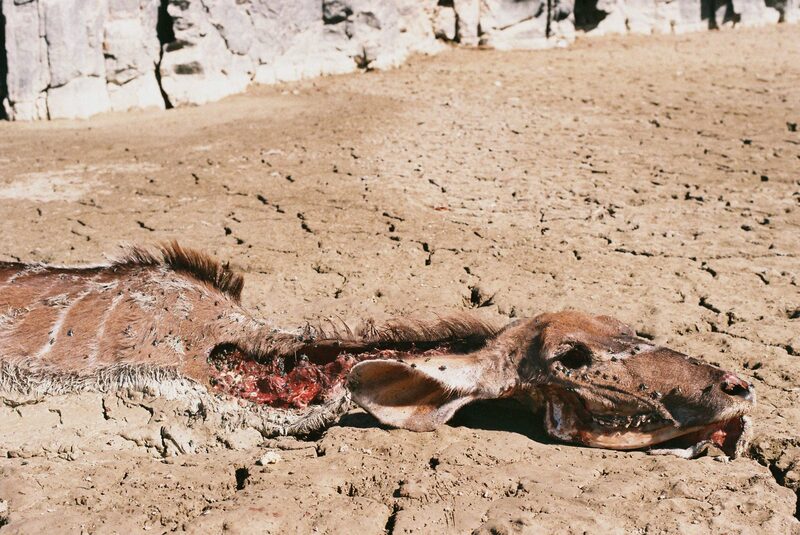 During the intense drought in the area over the last months, many animals had been breaking through fences to get to this dam, only to find it completely dry. In their search for water, these kudus tried to cross the dried dam floor, and got trapped in two mud sinkholes. They must have struggled there for days, before dying of thirst and starvation. And maybe something had started eating them while they were still alive. 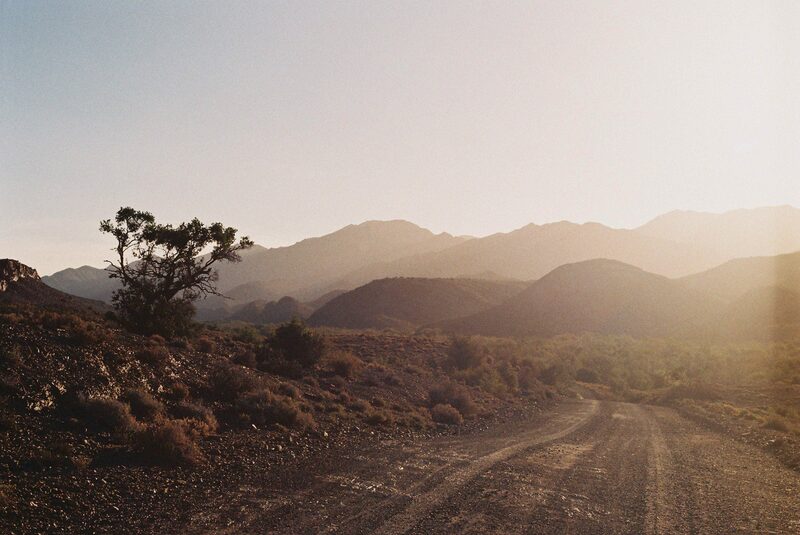 It was a stark reminder that the Karoo is a dangerous and remote place. This semi-desert region near the Southern tip of Africa is known for its searing beauty, but also its harsh and unforgiving environment. Get caught out here without water or shelter at the wrong time of year and it can be the end of you. We were on a 4-day recce for a route that might become South Africa’s first true gravel grinder style race. I foresee a gruelling 400 kilometer blast over 3 days, through little towns and along some spectacular but testing all-gravel back roads. Rules will stipulate simply – ride what you want, but strictly no suspension and drop bars only. There will be sunburn, loose sand, and sore muscles in the day, good food, plenty of wine and local culture at night. And I’m thinking of calling it Karoobaix. Karoo, in honor of this very special place of course, and Roubaix because of the arduous cobblestoned 1-day classic that is famous amongst cyclists as one of the hardest, most challenging races in the history of the sport. It’s an homage, but also a cautionary warning – it will be tough. This idea started a year or so ago while working on my other race, the Tour of Ara – a 6-day all-gravel stage race only open to pre-1999 steel road bicycles. The Tour of Ara is an intimate race only open to 40 riders, and racing an old steel road bike in the dirt probably has limited appeal. So with the sudden worldwide popularization of gravel or all-road bikes, I thought it was maybe time to do something a bit more inclusive here – an African style gravel grinder race. It was decided we would wild camp, and carry whatever we could in terms of food, water, and shelter. The route we followed didn’t offer much of any of these, and with winter approaching, hot meals and warm beds would be welcome. 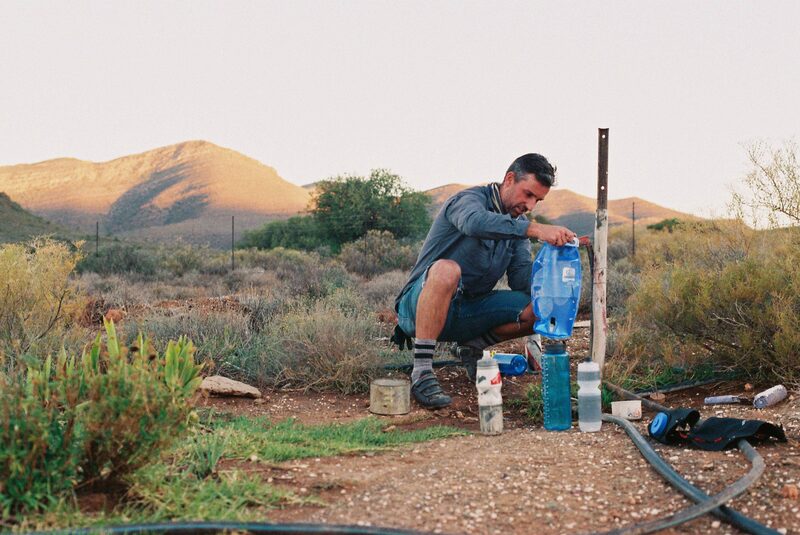 We left from Montagu, a small picturesque town where the Cape winelands meets the Karoo, on the Sunday following the inaugural Eroica South Africa. Still pretty exhausted from all the action leading up to Eroica, the ride, and of course the festivities the night before, we bought our last supplies and headed out of town. And straight up the Ouberg Pass. Steep, and long. But we made it to the top before sunset, and while Cameron, Bregan and Werner found the perfect wild campsite for our first night, Sven and I went to search for water. We got lucky and found a farm labourer living a few kilometers away, and after chatting to him and his young son for a while, we got our water and headed back to find the guys. They’d found a good hidden spot and were already collecting firewood. Soon the fire was burning, dinner was being prepared and wine and bourbon was being passed around. 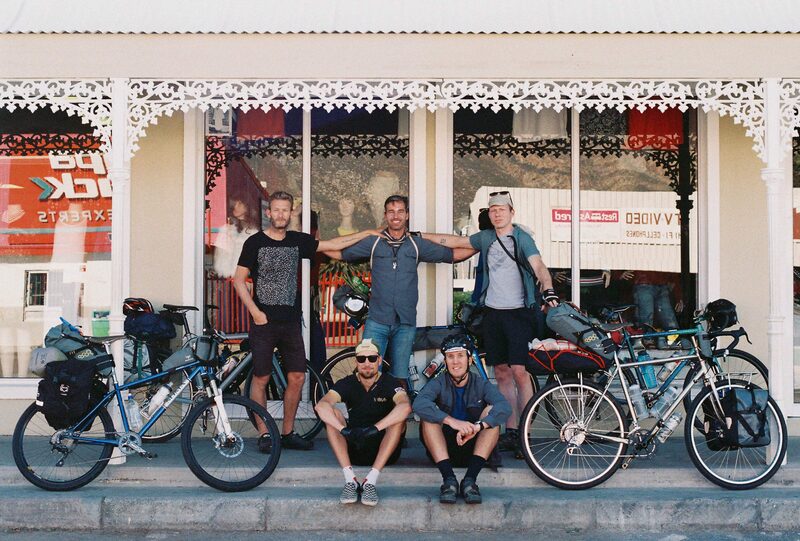 The next morning we rode our 100 kilometers to Ladismith, on varying condition dirt roads. On a rough section Sven’s pannier bag got pulled in the spokes of his rear wheel, and it dragged him to a skidding stop. The bag had been running too close to the wheel, and now that it had been caught by the spokes, everything was dangerously bent in. I hunted around the fence running along the road, and found some discarded fencing wire. With some zip ties and a bit of ingenuity we fashioned a brace to keep it all straight. Let’s go! It was hot and dusty, and a few hours later when we saw a river flowing out of the mountains near town, we knew it was time for a bath. We stripped down, waded into the shallow water and soaped up – much to the amusement of some locals watching all this from a distance. By the time we got into town it was getting late. Sven and I headed straight into the hellhole that is the Ladismith Ladies Bar while the other guys grabbed some supplies around town. After two huge beers, and getting shouted at for riding my bike on the dance floor, it was nearly dark. We headed straight to the mountains as quickly as we could. And we found a secluded little valley not too far from town. It was bushy and not exactly flat, but we managed to pitch our tents out of sight, and got straight onto dinner. In the morning we woke to see Sven on top of the hill above where we camped, and we hiked up to join him with all the equipment we needed for our morning coffee. From up there we saw that we were much closer to the town that we realized, and could look over the entire Ladismith laid out in front of us in the sleepy morning light. After breakfast we rolled out through town along a bit of tar before turning north onto the dirt road leading into the beautiful Seweweekspoort Pass. It’s not steep, but it’s definitely a steady climb before you exit the Klein Swartberg mountains almost 20 kilometers later. And this is where we stopped for lunch, at a sign pointing east to Gamkapoort. 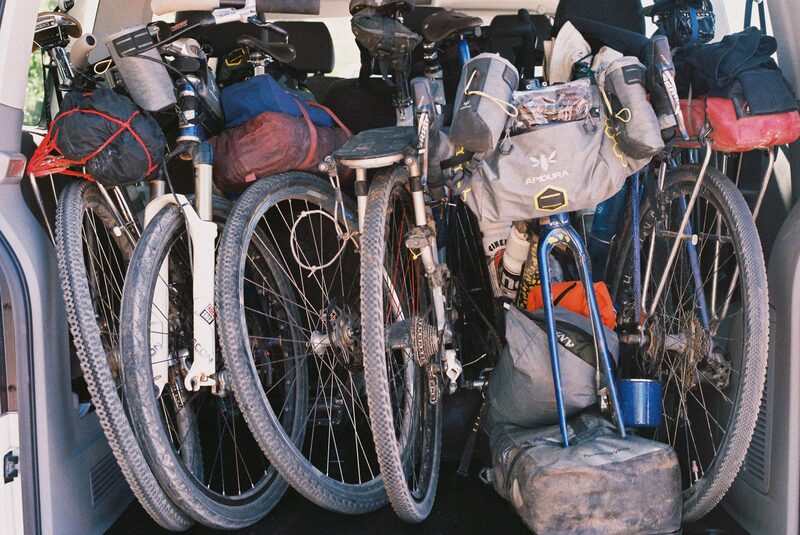 Now, the thing about traveling by bike, any traveling really, is that you have to be flexible. If an interesting opportunity presents itself, why not take advantage of it. Obviously none of us had ever been down to Gamkaspoort, since it’s a very remote outpost, and supposedly a dead end. But the urge to just go and see what was down there overwhelmed all our other plans, and by the time lunch was finished and we’d enjoyed a few sips of whiskey, we were heading east. 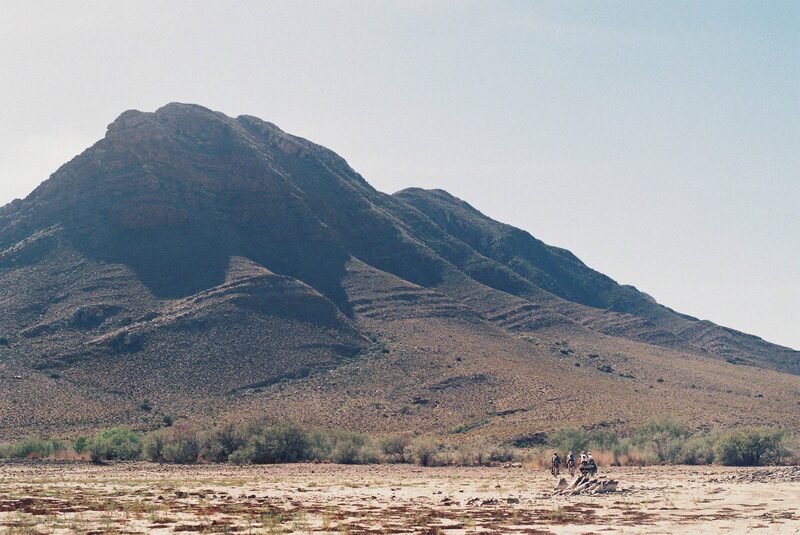 We detoured from our Karoobaix recce into the unknown. After a few kilometers down the road between the Swartberg and Elandberg mountains, we suddenly started dropping down a long, steep and rocky pass. The view along the Swartberg mountains to the east was nothing short of spectacular, but it was dropping fast out of view as we were heading down into a deep valley. It dawned on us, all separately, that riding back out of this would be seriously hard work, and we silently wished the unknown would present an alternative to get out. By the time we reached the bottom, it was getting late. The light was beautiful, and we encountered a lot of antelope seemingly headed the same way we were going. An hour later we’d reached our dead end. Gamkapoort Dam. The dam is normally closed to the public unless previously arranged. But two things conspired to make our impromptu visit okay. Fox, the custodian, is a cyclist himself. 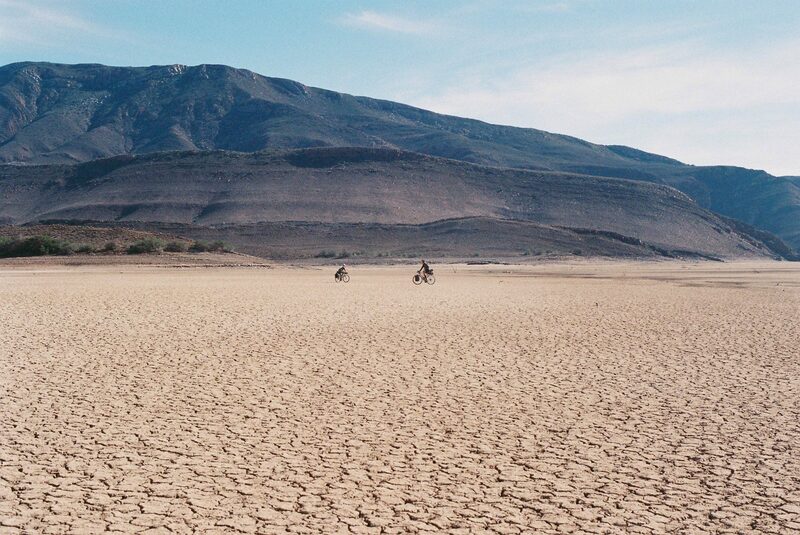 After weighing up our ‘story’ about wanting to see Gamkapoort and not really having much of a plan after that, and the fact that the dam is totally empty – surreally bone dry – Fox suggested a possibility. He graciously offered for us to camp near his cottages on the edge of the dam, and proposed we cross the dry dam floor in the morning to meet a road on the other side that would take us to the little village of Prince Albert. This happened to be where we’re headed on our Karoobaix recce, and will be where the race concludes. Of course we loved the idea of crossing the dam, and gratefully accepted his offer. Thanks Fox! We got to have a welcome cold shower outside, and the view from where we pitched our tents outside the empty cottages was breathtaking. Dinner was salmon and tomato gnocchi, and of course wine and whiskey. A breeding pair of fish eagles woke us in the morning, with their sad cry. There were three pairs living on the edge of this dam, but since it’s dried, there is only one pair left. As the sun rose we made coffee, and watched the light reflect in the little pools of muddy water here and there below us. The light was unbelievable, and my old Nikon FE film camera was working overtime. Because we were traveling so light, I unfortunately only brought my lightweight Series-E 50mm. Something wider would have been perfect here, but then working with what you’ve got has a certain poetry to it. Sven pulled yet another grapefruit out of his bag, and we got onto cooking breakfast. 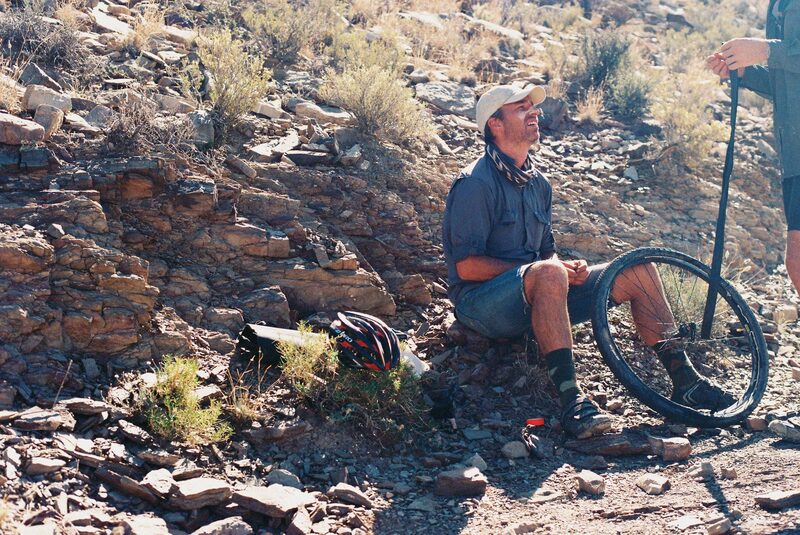 Over the years of bicycle touring, we’ve all developed our little tricks to be able to eat something fresh every day. It’s always surprising how long you can carry cheese or coriander or tomatoes. And what’s better than pulling off an amazing campfire dinner or breakfast. 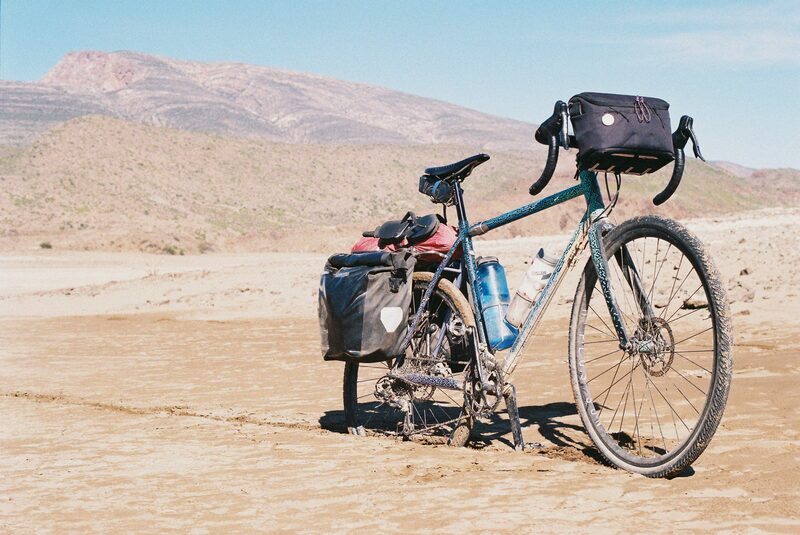 Bicycle touring is as much about good food as it is about adventuring. By the time we rolled down onto the dry dam floor it was already heating up. It was going to be a hot day. The dried mud was rock hard and smooth in places, in others it was rough with deep dark cracks, and of course there were sandy and muddy spots too, where you loaded bike could suddenly just sink as it broke through the surface. Many years ago there used to be a ferry that took the occasional traveler across the dam, but nowadays it’s impossible to cross, and not allowed without explicit permission. We got lucky. We had a rough idea where to pick up the old road on the opposite side, and proceeded cautiously as Fox had warned us about muddy quick-sandy sections. We approached a rocky outcrop, with many beautiful striations marking the diminishing water level. We stopped to catch up to each other and take a few photographs. Cameron stepped off his bike and to the side, and his shoe broke through the mud and he sank down to his knee, into the sticky, clayey mud. The surface looked completely solid. We had to watch out step. It was then when we saw it. The gruesome sight of two animals, partially protruding from their muddy graves and their exposed half-eaten flesh covered in flies. Somberly, we moved on. Our old road was rough and sandy, with sharp rocks sticking up through the sand everywhere. Within the first few kilometers we had thankfully our first of only two punctures on the trip. Sven had a long cut in his sidewall, and the sealant was leaking out. We repaired the gash, fitted a tube, and siphoned as much of the sealant we could save into the valve. What followed was more rocks, steep undulating hills that eventually gave way to nearly unrideable soft sand. As we rolled into Prince Albert a few hours later we headed straight to the hotel for beers. Since we were effectively a day early because of our adventurous shortcut through the Gamkapoort, I suggested we ride up the historic Swartberg Pass not too far from town to camp on top of the mountain. We loitered around drinking beers for a bit too long, and zipped out of town a little late. The Swarberg Pass is spectacular, but long, steep, rough and tough. It took us much longer than anticipated to reach the top, and we still had a way to go down to where we would camp. We were tired and hungry, and there was a freezing wind blowing. It was nearly completely dark, and Cameron and I speeded off to where we would camp. He would start setting up camp, and I would ride further to a little river I know to get water for the night. As we were dropping down I realized something was wrong. There had been a fire here, and the veld was destroyed – a sooty exposed mess. I was hopeful that the tree I had in mind to camp at might be okay, but as we rolled up to it my fears were confirmed. The tree was bare, and all the shrubby shelter around it had been burnt away. We couldn’t camp there, especially not so exposed in this icy wind. We had to make a call. We turned back and picked up Sven and Bregan on their way to us, and Werner who was still heading up the pass. After some discussion, we agreed to go and camp at the bottom of the pass, and we rode down the Swartberg in complete darkness. Haunting, and an experience in itself. At the bottom we searched around for a while and started dinner the second we found a good spot. Bregan whipped up a fantastic lemon and parsley couscous to go with the rich stew we made out of chickpeas, tomatoes and sweet potatoes, plus everything we had left over. Along with the wine and the last of our bourbon, it was the perfect meal on such a freezing night in the wild. After two weeks of tired legs …. The Colle Dell’Agnello marks the Giro’s passage into France for a couple of days and they’ll have to work hard to get up to the border. 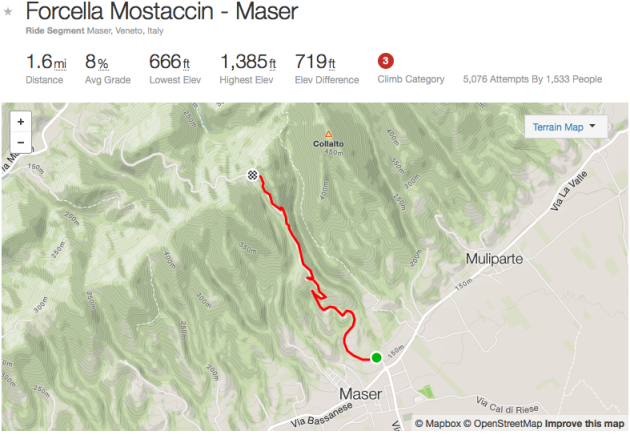 While the Strava segment shows it as a nine kilometre climb, the riders go uphill for around 70km from Saluzzo to the border at the top of the climb. 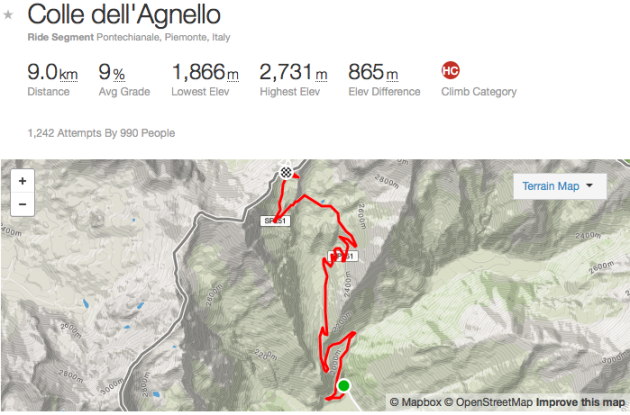 The toughest gradients come near the top of the Agnello, maxing out at 15 per cent and holding at over nine per cent for much of the nine kilometres, with riders reaching the highest point of the whole race. 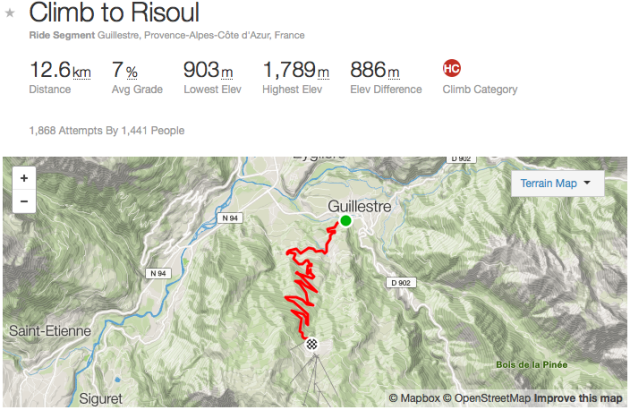 When the riders get into France it’s downhill all the way to the foot of the climb to Risoul, where stage 19 finishes. It’s not the hardest climb in the world but the legs and bodies of the climbers will be cold from the very long descent from the Agnelle. 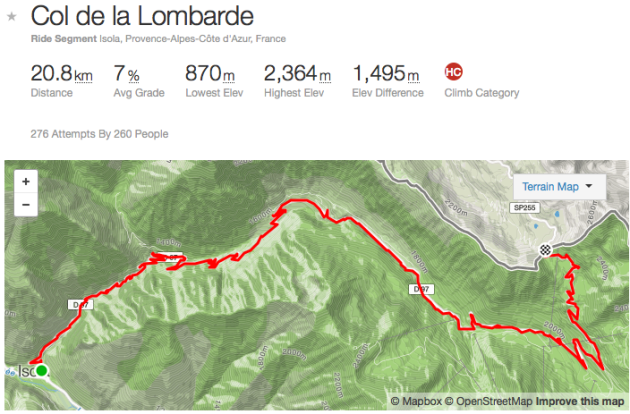 It maxes out at 10 per cent in the first third of the climb and from then is a steady 8.5 per cent to the top. With the GC still up for grabs it’ll likely to be a battle ground all the way up, with attacks likely to come on the preceding descent. 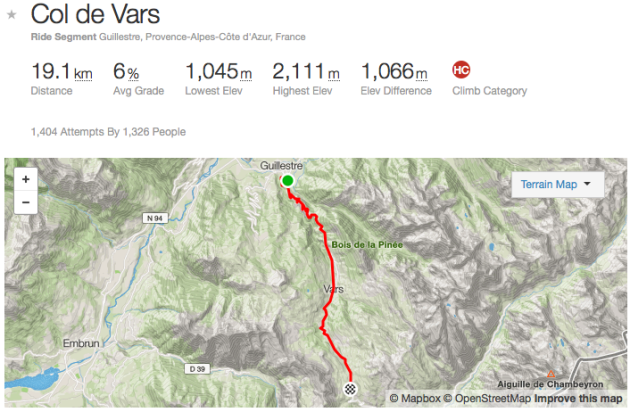 At just six per cent in average gradient, the Col de Vars shouldn’t cause any problems, but it’s the fact that it comes immediately at the start of stage 20 which makes it hard. The riders will have to get their warm-ups done before the stage if they’re to be in any state to be up at the front of the peloton in the first 20km. There’s not a metre of flat on the entire stage, making it one of the toughest in the whole race, so if there’s still anything to play for in the general classification, expect to see some action in these opening exchanges. Once they’ve descended from the Col de Vars the peloton hits the even longer and even tougher Col de la Bonette, taking the riders up to over 2,700m. It’ll be a long, cold descent down to Isola at the foot of the third big climb of the day, with almost 40km of downhill, interupted only by a little flat bit after 25km. With the stage only 134km in length we could see attacks on the pink jersey wearer on the early climbs, just like we did on stage 16 on Tuesday. As if two 20km ascents weren’t enough, the organisers have chucked in a third one near the end to really test the climbers’ resolve. The Col de la Lombarde brings the riders back into Italy for the final assault up to Sant’Anna di Vinado, where the finish line is located. Like the first two climbs on the stage, the Lombarde isn’t particularly steep, it’s just relentlessly long, especially after the climbs that have come before. It’s last chance saloon for GC contenders to launch their attacks, with the climb to the finish not really long enough to make up minutes of time. From a very early age, I equated bicycles with freedom. With the aid of my two-wheeled companion, I was free to explore the seemingly endless collection of trails and dirt roads that were so plentiful in my youth. At the same time, that freedom instilled in me the importance of self-sufficiency. I learned firsthand that something as simple as a flat tire often meant a verylong walk home. It didn’t take me long to figure out that carrying even the barest of necessities could eliminate those unplanned walks home. As an adult, I’m surprised at how often I encounter stranded riders who are carrying no tools or spares. While they may have cell phones, their mechanical issues can usually be fixed in less time than it takes for them to be rescued by a friend or partner–if they had the necessary equipment. I’m not advocating that riders should be able to overhaul a cup-and-cone bottom bracket in the field, but carrying even a bare bones repair kit can mean the difference between riding and walking home. After several years of fine tuning and experimentation, I’ve found that having two separate repair kits works best for me. I use a smaller kit for road and gravel riding, and have a second, larger setup for mountain and adventure-type riding. While each kit is a compromise of weight and size, I’ve never had to abandon a ride because I wasn’t carrying the necessary tools or spares. Having tools without knowing how to use them won’t do you much good, though. If you’re not sure how to fix a flat or adjust your bike’s brakes or derailleurs, see if your local bike shop offers maintenance classes or clinics. Even though road and gravel makes up the majority of my riding, mechanical issues are few and far between. Problems are usually limited to the occasional puncture, or the need to make a minor adjustment. My road/gravel kit reflects those needs, and it gets tossed into whatever panniers or pack that I happen to be using at the time. While the majority this kit’s contents are old favorites, the Blackburn multi-tool is a relatively new addition. Thanks to the Grid 13’s extensive set of features, it actually replaces several individual tools. The sturdy, all-in-one design is definitely more convenient, and reduces the likelihood of losing one of the smaller wrenches on the road or trail. Thanks to tubeless tire technology, I experience very few punctures. Tubeless sealant tends to dry out quickly here in arid Colorado, so I do carry a small bottle of sealant in case a tire needs topping off. The inner tube is backup in the event of a slashed sidewall (or if a puncture is too large for sealant). Although not shown in the photo, I wrap my tubes in repurposed Tyvek shipping envelopes, which can be used as emergency tire boots. 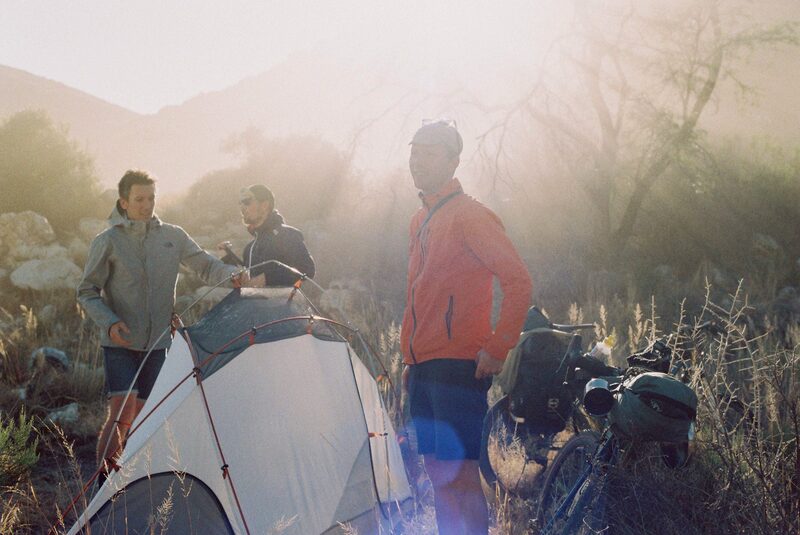 Looking at all this gear, you might get the impression that mountain biking or adventure riding is a lot harder on equipment than road or gravel riding. The truth is, most of what I carry in this kit is for fixing other people’s bikes on group rides (or helping stranded solo riders). Some folks might argue that being a rolling bike shop discourages other people from being self-reliant, but I don’t mind lending a helping hand when it’s needed. Most of the above items are what you’d find in a mountain biker’s or adventure rider’s hydration pack. The 27.5″ tube can be used in 26″ or 29″ wheels in a pinch, and the Presta valve is also compatible with Schraeder-drilled rims. Wippermann’s Connex chain tool may not be the smallest or lightest, but it’s one of the most reliable and it comes with a reusable quick link. Why carry a multi-tool and Fix It Sticks? The multi-tool is fine for most adjustments or repairs, but sometimes you need a little extra leverage for components such as single-bolt seatposts or crankarms. As I mentioned previously, I’ve fine tuned these repair kits to reflect my particular needs and conditions. Think of these lists as suggestions or starting points, but don’t hesitate to add–or remove–items that will make your bike more reliable–and ultimately–more enjoyable. We’ve had a few tough ascents so far in the Giro d’Italia, but we’ve not experienced the true mountain stages that the race is famous for just yet. As the race heads north the number of climbs on the route increases and the less the sprinters look forward to the stages. Three of the six stages before the next rest day are over 200km in length and there are 16 categorised climbs to take in between now and Sunday. The sprinters will have their fun on stage 12, but week two belongs to the climbers and here are five of the toughest tests they will face this week, including a mountain time trial on stage 15. It’s by no means the longest climb in the race at just shy of three kilometres in length, but coming at the end of a pan flat stage the Forcella Mostaccin climb could split the peloton. With a maximum gradient of 16 per cent and an average of over 10 per cent for the last kilometre of the climb we could see a few attacks go off the front on this climb. The race still has around 25km to go from the top, but the rolling nature of those final kilometres means it almost certainly won’t be a bunch gallop. Montemaggiore probably won’t be a decisive climb in the Giro because it comes so close to the start of the stage – the climb starts at kilometre 48 – but it heralds the start of a tough stage for the climbers. 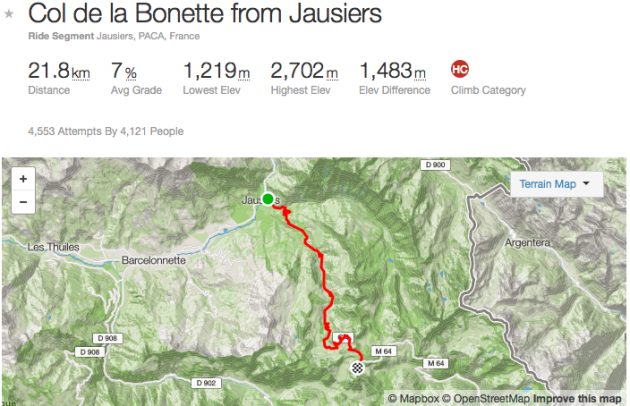 Just over eight kilometres in length, the climb averages nine per cent, but that doesn’t tell the whole story. The first 2.5km kilometres are pretty straightforward, but then the hill ramps up to over 10 per cent for the rest of the climb, maxing out at 15 per cent in the final 500m. There’s a sting in the tail of this one, and after a short descent the riders are heading uphill again on this very up-and-down stage. The Montemaggiore climb earlier in the day may be more relentless, but after 130km of racing up and down mountains this climb of Cima Porzus could see a few riders crack. Again, the climb averages nine per cent, but rarely does it go below that gradient. The riders will have to plug away for 8.5km at a steady gradient while they plan their finishing strategies. This climb is followed by a shorter ascent to Valle, so attacks may come there rather than on the Cima Porzus, but this climb will certainly sort the men from the boys and the sprinters autobus will be stamping a lot of tickets. Anyone who has completed the Maratona dles Dolomites sportive will know the Passo Giau very well. The scenery is stunning, but the ascent is pretty relentless. From Selva di Cadore the climb starts off hard (a kilometre at over 10 per cent) and continues in a similar fashion for the next seven kilometres. Again, this climb might not be in a location to be the place of crucial attacks, with another climb following immediately afterwards, but it promises to be a great part of this year’s race. One for the breakaway, maybe. As if riding up mountains wasn’t hard enough, imagine smashing it up as hard as you can with no teammates to help you out. That’s what the riders face on the Alpe di Siusi on stage 15 as a mountain time trial could well separate some of the favourites for the maglia rosa. Movistar‘s Andrey Amador holds the Strava KOM on the climb, set on a recce back in March, smashing up in 31 minutes at a modest 166 beats per minute on the heart rate monitor.